The countdown has begun to the fourth World Sheep Dog Trials – to be held in England for the first time at Lowther Park Estate, near Penrith in Cumbria, on the edge of the Lake District, from September 15-18, 2011. A launch event will take place next month at The Punch Bowl Inn, Askham, on Thursday, May 13, from 7pm. The World Trials are the pinnacle for working sheep dog enthusiasts around the globe. They take place every three years, with previous trials having been held in Wales, twice, and Ireland. Visitor numbers have been between 20,000 and 30,000, bringing in an estimated £3 to £4 million into the local economy. Organisation of the World Trials, administered by the International Sheep Dog Society (ISDS) and held at Lowther Park by kind permission of the Lowther family, is in the hands of a local committee. It is headed by ISDS English president and renowned trialist Tim Longton, of Rooten Brook Farm, Quernmore, Lancaster. Tim is the four times English brace champion and three times reserve English national champion. Qualifying rounds will take place on three separate fields on the first two days of the four-day trials, with the top seven from each field on the opening days going forward to the semi-final on the Saturday. The top 16 of these qualify for the final on the Sunday, from which a world champion will emerge. World Trials chairman is Burton-in-Kendal agricultural solicitor Nigel Davis, who has been involved in the regional sheep dog trialing world for many years. Nigel was secretary for the English National Trials held at Dovedale, Derbyshire, in 2008 and legal advisor and general advisor to the International Trials held at Lowther Park last year. Co-ordinator of the World Trials is English National sheep dog trials stalwart John Palmer, of Higher Higson Farm, Twiston, Clitheroe, with Lowther Park Estate represented by sponsorship co-ordinator and farm manager Richard Price, of Lowther Park Farms. Mr Palmer said: “We can expect around 30,000 people over the four days, which will provide a tremendous boost to the regional economy, in particular accommodation providers and catering establishments. One major sponsor has already signed up, natural dog food company CSJ Specialist Canine Feeds, of Bwlch Isaf Farm, Bodfari, Denbighshire. 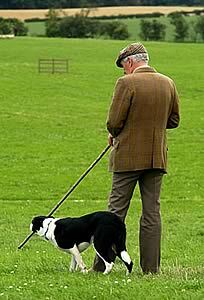 The company also sponsored the World Sheep Dog Trials when last held in Wales in 2008. Launched in 1998 by international sheep dog trialist, Ceri Rundle – her father is the famous Welsh handler H. Glyn Jones - CSJ has become one of the fastest growing brands of natural canine feeds, herbal supplements and treats, gaining popularity among many top dog handlers. “The health and welfare of all working sheep dogs is central to our ethos and we are delighted to continue to support the World Trials on their first foray into England,” said Ceri.